For Saitek Pro Flight Instrument Panel. This is version 4, some mistakes in tapes' numbers are fixed, a minus sign is added to the vertical speed tape when descending, instructions updated (unexpected spaces and words). This is folder contains 4 PFDs. There are two sizes of numbers for radio height and for vertical speed. There are two positions for DME2, VOR2, Course and autopilot heading, lower left or lower right positions in the FIP. Codes have been reworked to be more FPS friendly. PFDVGE4 provides horizon, speed, altitude and compass tapes. Localizer and glide slope. Flight director bars. Vertical speed with needle and numbers. Radio height, VOR1, DME1, VOR2, DME2, ADF, Course and autopilot heading in numbers. Autopilot bugs for speed, heading, altitude and vertical speed. Autopilot lights for functions: Master AP, Flight director, Altitude, heading, auto throttle, speed, Mach, approach, back course and NAV. TAT, QNH and Mach. Left knob moves course and right knob moves QNH. FS2004 and FSX : Fuel Quantity indicators for KingAir: A side indicator - lacking in the default FSX KingAir 2D view. Two gauges - for FSX and for FS2004 as well - with 1850 lbs et 2250 lbs max level (i/o 1400 lbs in the default instrument). By Pierre Fasseaux. For Saitek Pro Flight Instrument Panel. This is folder contains 4 PFDs. There are two sizes of numbers for radio height and for vertical speed. There are two positions for DME2, VOR2, Course and autopilot heading, lower left or lower right positions in the FIP. Codes have been reworked to be more FPS friendly. PFDVGE3 provides horizon, speed, altitude and compass tapes. Localizer and glide slope. Flight director bars. Vertical speed with needle and numbers. Radio height, VOR1, DME1, VOR2, DME2, ADF, Course and autopilot heading in numbers. Autopilot bugs for speed, heading, altitude and vertical speed. Autopilot lights for functions: Master AP, Flight director, Altitude, heading, auto throttle, speed, Mach, approach, back course and NAV. TAT, QNH and Mach. Left knob moves course and right knob moves QNH. For Saitek Pro Flight Instrument Panel. This folder contains 6 types of EICAS (Engine Indicating and Crew Alerting System) for BAE146, B747, A380, A340, an all types in one and a single full display EICAS. Each aircraft has 3 EICAS, EICAS2 and 3 provide same information indifferent ways. EICAS 1 provides: N1, EPR, EGT, N1 bug, Throttle lever bar, Reverse text, Pitch trim, Spoilers, Gears position, Flaps position, TAT, Total fuel quantity. Left knob adjusts Spoilers. Right knob adjusts N1 bug. EICAS 2 provides: N2, Fuel flow, Oil pressure, Oil temperature, Engine vibration, Throttle lever bar, All individual fuel tanks quantity, total fuel quantity. No action with knobs. EICAS 3 provides same as EICAS 2 but all left fuel tanks quantity, all center fuel tanks quantity, all right fuel tanks quantity, aileron trim and rudder trim. For Saitek Pro Flight Instrument Panel. This is the second version, you can delete previous one. This folder contains 17 types of EICAS (Engine Indicating and Crew Alerting System) for Lear45, CRJ700, B737-800, B767-300, MD83, A300B1, A300B2, A350, CRJ100, CRJ300, B777-200, A320, A321, A310-100, A300B4, A350-800, B777-200ER, B787, A310 standard, A310-300, A330-200 and B777-200LR. They replace older tje xml files, they have been improved and provide following utilities:N1, ITT, N2, fuel flow, Vibration, Oil pressure, Oil temperature, Landing gear position, Flaps positions, Pitch trim, Spoilers positions, Total, main tanks and auxiliaries tanks fuel. The left knob activate spoilers, the right knob adjusts the N1 bug for autopilot. Added two extra xml, if you do not find your favorite aircraft you can use the tje_full_range.xml which has total fuel of 6 digits, 5 digits for all tanks and full 8 flaps steps, this should fit with any twin jet engine aircraft. If this is not sufficient then use tje_extra_range.xml with 6 digits for all fuel and 8 steps for flaps. If you need more, that means you are flying a military tanker ! 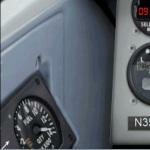 FSX Vertical Speed Gauge with audio callouts. A V-Speed gauge, that when installed into an aircraft panel will calculate the V1, V2 and V3 take of speeds for civilian aircraft, regardless of load or flap settings. The readout will be displayed in an easy to read format in the 2D cockpit, and also includes aural sounds for 80 knots, V1, Vrotate, and V2 speeds, at which point the VSI should show a positive rate of climb. Original gauge for FS2004 by Jacob Larsen (JEL), and modified for FSX by Anthony Eades. The first installation instructions for the V-Speed gauge "Fsx_jelair04vsp" were incomplete. This meant that the aural sounds were not activated. This download will correct that problem. I received several mails about problems with my gauges. This folder contains instructions to fix the problem with my gauges. This is due to a wrong line in the SaiFlightSimX.xml file. A good flight has to end with a great landing. For a great landing you’ ll need precision. And for precision you need an accurate and readable Radio Altimeter (radalt) reading. FSX does provide radalts with most jets but they are not accurate and sometimes not readable. With this update 3 different types of aircraft receive a correction to the radalts readings and they are now easily read, almost like the real thing. PFD for FIP Patch. Correction for the PDF gauge for the FIP. I missed an information in installation instruction. In SaiFlightSimX.xml instruction, instead of File="pfdvge.xml" read File="Gauges\pfdvge.xml"